new FTD soundtrack - pallid imitation or guilty pleasure? Elvis' 21st movie was a pallid imitation of Blue Hawaii and Elvis knew it. At home Elvis was exploring his spiritual side & the meaning of life. Along with all the other creative musicians of the time, Elvis was reading insightful books like Aldous Huxley's 'The Doors of Perception' and Timothy Leary's 'Psychedelic Experience'. The Beatles were recording 'Rubber Soul', Dylan was writing 'Like A Rolling Stone', while Elvis is presented with filming one of the worst movies of his career and soundtrack numbers life 'Queenie Wahine' and 'It's a Dog's Life'! Paradise Hawaiian Style is the eighth FTD extended movie soundtrack release. Once again presented with the original LP with improved audio, alternate takes, plus a colour booklet full of photos and information. Many Elvis fans would have previously purchased these soundtracks on LP and again via RCA's "Double-Feature" series. Here we have an in-depth look at each one to see if they are worth buying again. 'Paradise Hawaiian Style' (August 1965. 24 tracks, 69 mins). Despite the quality, The Colonel had negotiated with producer Hal Wallis a $90,000 bonus taking 50% for himself! The movie was by first-time director Michael Moore, but he's not the same recent publicity-crazed Michael Moore! Elvis usually loved Hawaii but this time even Movie News reported, "Elvis arrived in Hawaii without his usual smiling face. When Elvis finally went to work in front of the cameras, he was not his usual patient and polite self. He continually grumbled about the way his privacy was always being disturbed." RCA obviously thought Elvis was looking a little fat and used a 1963 photo from Fun In Acapulco for the front cover of the album. (RCA had also done a similar thing for the LP cover of his last film Frankie & Johnny!). The soundtrack LP only ran 22 minutes in total and disappointingly there were no exciting Bonus tracks this time. Not surprisingly no soundtrack song was considered worthy of being a single and the exquisite 'Love Letters' was released instead. Interestingly 'Love Letters' only reached #19 in the charts and Elvis wouldn't get another Top Twenty hit until 'If I Can Dream' two and a half years later! 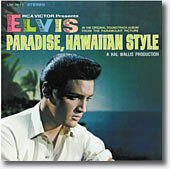 Elvis' faithful fans still bought this (dog of an) album getting the Paradise, Hawaiian Style soundtrack LP to #15. This was a better placing than Frankie & Johnny (#20) and even more surprising, higher than the fabulous 1966 'How Great Thou Art' LP which only peaked at #18. At the time Elvis said that he was ill and did not turn up for the planned Soundtrack sessions. Interestingly, on the second day The Colonel phoned the studio to say that Elvis would be there within an hour, but Elvis still didn't arrive. Since Elvis doesn't make the recording session, time is saved by getting Elvis to record vocal overdubs later. This means that there can be no band interaction nor any interesting musical development on the outtakes since Elvis just sang over prerecorded backing tapes. The soundtrack session can hardly get worse than this, and the only thing to save it will be the humour that Elvis sees in the dreadful material and his sincerity in singing the few worthwhile tunes. Music-wise FTD is again back on track and the muffled hiss of the original LP has been improved, sounding very similar to the Double Features issue. The original LP sounded almost mono and the real delight here is the remaster of the outtakes giving the band a new clarity spread over a truly wide stereo spectrum. In fact the surprise here is that the remixed outtakes are so clear that they no longer have that original sound of Elvis singing on top of a backing tape. This is particularly enjoyable on tracks like 'House of Sand' or the title track. The outtakes this time do not have the totally 'dry' sound of Radio Recorders but nor do they have the echo of the original Masters. Elvis' band was the usual excellent team and this time also including the talented jazz guitarist Barney Kessel (Charlie Parker, Beach Boys etc) and even Larry Muhoberac on piano. However there was little they could do with such poor material and, of course, Elvis not being present in the studio made things even worse. Hill & Range staff writers Giant/Baum/Kaye contributed 6 of the ten songs - who else would be interested in writing film songs for Elvis at this point? While they have to held responsible for some real stinkers like 'Queenie Wahine' and 'Beach Shack' they have to be forgiven since, surprisingly they also wrote the classics, 'Edge Of Reality' and 'Power Of My Love'. Having been so negative, FTD have done a great job with this release and the deluxe gatefold sleeve packaging contains great pictures including a couple of cute candid photos as well as some outtake scene photos. The challenge for Ernst & FTD was to keep the chosen outtakes interesting and since these are overdubs the earliest takes, while Elvis gets to grip with the songs, will be most attractive and here we get first takes of nearly every song. Although I have rarely, if ever, played Paradise Hawaiian Style in recent years I felt a guilty pleasure in enjoying this CD quite so much! 'This Is My Heaven' - Immediately you notice the expanded stereo image of the outtakes, Elvis' vocal is higher in the mix and balanced nicely against the Jordanaires' vocals. There is also a better bass-feel & clearness to the band track. The version previously released on 'Out In Hollywood' had unnecessary added echo and it sounds much better here. This was one of the more interesting songs, which presented Elvis with a vocal challenge. On the first complete take, (Tk3), he drifts away from the Jordanaires' timing which explains his cute comment "Where was that last part?" that we have already heard on 'O.I.H'. 'A Dog's Life' - The funniest takes that were released on the EAP Silver box-set are presented in their correct sequence here. Take 4 was never actually on the EAP Silver box-set (they only used the countdown edited onto take 6) and the audio channels were also incorrectly reversed Left<>right. A terrible song but with Elvis cracking up with laughter they are a treat. Elvis sings one line of 'Star Spangled Banner' (his comment on the quality of the song?) and the fact that he shows such good humour is a wonder. The previously unreleased Take 8 is actually the most enjoyable when Elvis adds, "Bow-wow, hot dog , Oh no .." to the lyrics and ends with a fabulous, "Rufff". A gem. 'Drums Of The Island' - Unfortunately you feel that much more could have been made of the Polynesian rhythms had Elvis been present in the studio. The original sounded too subdued for film's finale but this outtake audio-mix is a great improvement on the LP. The earlier take is also interesting since Elvis hasn't quite worked out the ending yet. 'Queenie Wahine's Papaya' - Elvis should never have been made to sing the lyric, "Though some people's palates prefer picked salads" and I just can't listen to it again. The engineer comments, "Think slow EL, and it'll sound faster!" with a laughing Elvis replying, "Go back to the other studio!" 'Stop Where You Are' - There was always a noticeable slight buzz on this track & now you can hear that it was on the band's backing tape! How odd that it was deemed acceptable. Take 1 is nearly complete but Elvis can hear hammering in the background causing him to stop, which then produces some fun in the studio. 'House Of Sand' - One of the better songs with a cool swinging sixties vibe, nice guitar work, plus a newer funkier mix here. Take 3 has a great ending, very different from the Master. The treat here is that we finally get to eavesdrop on the recording process as Elvis' records the film intro to the song. Again he complains, "I've got a nose full of chicken soup, I've gotta go!" and there are 10 takes just to get the one line correct. Great entertaining stuff. 'Paradise, Hawaiian Style' - The original Master was an edit of Take 3 & 4 so here we cut straight into the rejected second half of Take 4. Elvis adds the lyric "Wasn't that nice, baby?" to the song and tries out some great vocal flourishes. Take 1 is also a delight with a great fuller sound and a complete ending without the fade out. 'Scratch My Back' - I'm afraid the best version is the film duet with Marianna Hill, which sadly we don't get here. However the original had a very elongated early fade-out but on Take 1 we get the better complete ending. Annoyingly the LP Master used here is still the original version, with the first couple of notes of the intro clipped but is complete on the outtake. 'Sand Castles' - Another delightful song which sadly was edited out of the actual film. Take 1 is an exquisite version as it features Elvis singing almost a-capella at points. A beautiful mix with the band deliberately in the background. Superb. Verdict - In truth I felt trepidation at the thought of buying this Paradise, Hawaiian Style extended soundtrack since the original LP's 22 minutes were pretty hard to bear. However FTD have possibly been at their most creative by producing an extremely enjoyable CD from such poor original material. The improved sound of the outtakes certainly helps, and I've felt a guilty pleasure because I've enjoyed it so much! A while back the thought of the future 'Double Trouble' soundtrack release was filling me with dread but now I am actually looking forward to it! While Viva Las Vegas remains the essential soundtrack purchase you, too may find guilty pleasure in this CD. FTD, please keep 'em coming! If you have ever enjoyed the happiness & fun of Elvis' movies then FTD's Special Edition Soundtrack series are well-worth exploring. EIN suggests you buy the essential 'Viva Las Vegas' and then continue with your favourite selection of Elvis' movies.